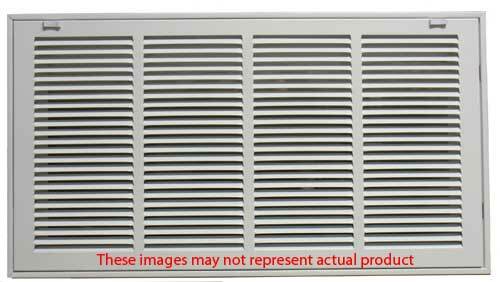 20 X 16 White Steel Return Air Filter Grill Discounts Apply ! Install a white filter grille such as this one for any home renovation project. Replace any old white filter grille with this item during commercial or home renovation to put the finishing touch on hardware upgrades. This white filter grille features sturdy stamped steel construction and a bright white painted finish, sealed with clear lacquer. The grille has a hinged faceplate which opens easily, making the filter easily accessible for quick and simple filter replacement. This white filter grille easily installs into ceiling or sidewall duct holes that are 20 x 16 inches (length x height/width). Please note that a filter is not included with this white filter grille - it must be purchased separately. Also available are plain white return air grilles. Please Note: Allow 7 - 10 business days to ship from the manufacturer. Coordinating permanent air filters for your return air filter grill are also in stock.